…then check out a post I wrote for the Abraham Lincoln Institute for the Study of Leadership and Public Policy’s blog. Actually, it’s my take on a couple of editorial writers’ take on NPR’s take. But you get the idea. Experience war. And bring your rubber swim pants. Conner Prairie Interactive History Park in Indiana opened the lengthily-titled “1863 Civil War Journey: Raid on Indiana” this month. I’d always thought Conner Prairie was your basic outdoor living history museum, sort of along the lines of Colonial Williamsburg, but apparently at some point it mutated into an “interactive history park” and it’s got the title to prove it. The drama is staged in buildings meant to represent the town of Dupont, Ind. During the Civil War Dupont was attacked by thousands of Confederates led by John Hunt Morgan; they had been riding on horseback through Indiana, plundering and pillaging, wrecking rail lines and cutting telegraph wires.“Morgan’s Raids” are the only Civil War battles that took place in Indiana. Now they are taking place here. We are in a historical village of sorts, whose broad-timbered barns are authentic, but whose other buildings were constructed for previous interactive exhibitions. They are inhabited by costumed interpreters who treat visitors like recruits preparing to battle Morgan’s marauders. We can see the effect of earlier attacks, including a smoldering ruin and the burned facade of the train depot. Such historical “sets” exist elsewhere in the park too, including an 1836 village,Prairietown, and a Lenape Indian Camp. They require a strenuous suspension of skepticism, along with a readiness to welcome the conversation of gruff blacksmiths pumping on bellows before they hammer out authentic 19th-century-style nails. But Conner Prairie, at least in the Civil War “journey,” turns the notion of a historical village inside out. First it tries to create a continuous narrative through which visitors are led; then it rips aside the historical mask with contemporary special effects. We stand in Mayfield and Nichols Dry Goods Store as it comes under attack, for example, and we realize that aside from posters advertising vintage Roback’s Stomach Bitters, the room is also stocked with sub-woofers and flat-screen video monitors through which we experience the attack and the plunder. Nearby, in a cozy home left in some disarray by bivouacked soldiers, 3-D video projections bring us accounts of a young black man who was imprisoned by the raiders and then escaped. There are touch-screen monitors in one room, offering simple video games that challenge you to stop the raiders. At the climax, you are led into a multimedia presentation about Morgan’s raids and his ultimate defeat, including flashes of footage showing the militia gathering to defend the town — which playfully turns out to be the audience marching into the theater. The experience has something for every age and interest from the self-led journey about Morgan’s Raid on Indiana to a family play area designed for children ages 2 to 10, including an indoor climbing area and outdoor water play area. However, in select areas, 1863 Civil War Journey utilizes strobe lights, loud noises and images of war that may not be suitable for young children. You can see the “outdoor water play area” in this video clip. It’s supposed to be patterned after the Alice Dean, a side-wheel steamboat built in 1863 that Morgan and his men captured and burned. Personally, I think it resembles a partial set for a high school theatrical production with a jumbo kiddie pool stuck to the back. The play area includes water cannons, which is of course appropriate because (a) the Civil War had cannons and (b) boats generally involve water. What should children wear in the water play area? Swimwear is not acceptable in the water play area; guests may bring additional dry clothing and towels as needed. Family restrooms are available in the River Crossing Play Area. Children who are not toilet-trained are required to wear a swim diaper covered by rubber pants with tight-fitting elastic at the waist and legs. Any child who has had diarrhea within the last 2 weeks is not permitted to enter the water play area. When you have to start worrying about strobe lights and diarrhea, maybe your history exhibit has gotten a wee bit too interactive. The Times article was listed as a “theme park review,” by the way. I’m not sure if that’s the label Conner Prairie was shooting for, but it looks like now they’re stuck with it. What if Thomas Lincoln had stayed in Kentucky? The Lincolns were a mobile family, in the geographical though not the social sense. Born in Virginia during the Revolution, Thomas Lincoln ended up at the farm near Sinking Spring in Kentucky which is now a national monument, only to move to another plot of land nearby shortly after the birth of his son. A few years later, the family packed up and headed for Indiana—partly because Kentucky’s chaotic land titles made life a nightmare for small farmers and partly because Kentucky was a slave state. The Lincolns moved again about the time Abraham became an adult, and when they arrived in Illinois he struck out on his own. It didn’t take long for him to make a bit of a name for himself. Although he lost his first election for the state legislature in 1832, he was extremely popular among his neighbors in and around New Salem. His second run two years later was more successful, setting him up for his rise to prominence in state politics, which in turn eventually led to national recognition. 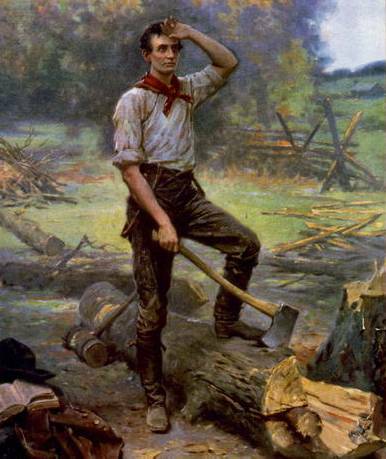 "Lincoln the rail splitter." c1909. Prints and Photographs Division, Library of Congress. That a relative newcomer, still in his early twenties and without wealth or substantial connections, could make such a promising start says something about Lincoln’s abilities. But it also says something about frontier Illinois. It seems unlikely that someone from such humble circumstances could so quickly become a legislator, postmaster, surveyor, and local notable in a more established community. Lincoln’s intelligence and political abilities gave him a jump-start, but it didn’t hurt that it was easier to get attention in a place like Sangamon County than in other places. This raises an interesting what-if question. What if Thomas Lincoln had stayed in Kentucky? If his land title had been more secure and he’d decided to settle down, how would it have affected his son’s career? Abraham Lincoln would have done something; he was far too ambitious and talented to live the same sort of life his father had led. But would he have risen as far and as fast in Kentucky as he did in Illinois? Maybe it wouldn’t have made much difference at all. Perhaps west-central Kentucky was as congenial an environment for an obscure young politician as frontier Illinois. The same political gifts that served Lincoln so well in New Salem and Springfield probably would have had a similar effect among the farmers around Hardin County. It’s easy to imagine that he might have followed a similar trajectory in early adulthood—using his local influence to gain a place in the state legislature, setting up a law practice, and so on. But then what? Would he have been able to become an influential figure on the state level in the same way that he did in the Midwest? Remember that Lincoln’s opposition to the spread of slavery was a handicap in the 1858 campaign against Douglas. How much more so would it have been in a slave state? On the other hand, maybe Kentucky would have allowed Lincoln to advance to national fame earlier than he did. His attachment to the Whigs could have earned him some powerful allies and patrons in the home state of Henry Clay. Perhaps even Clay himself might have taken notice of a Kentucky lawyer and state legislator who idolized him and had an acumen for politics, and then taken him under his wing, allowing him to play a larger role in the Whig Party than he ever did in Illinois. With better connections, Lincoln might have been more than a one-term congressman in the 1840’s. It’s also possible—and perhaps extremely probable—that Abraham Lincoln would have ended up in the Midwest anyway. After all, he was intensely ambitious but lacked wealth or connections. He undoubtedly would have set out on his own as early as possible to look for opportunities to advance himself, and perhaps he would have thought it best to leave Kentucky entirely. He wouldn’t have been the first obscure young man from a modest background to look westward and see tantalizing possibilities. Photo sharing of ancestors who fought in the Civil War or a recent visit to Gettysburg. Essay sharing to upload Civil War stories passed down through the generations or an observation about the battlefield. Historical blog, “This Great Task Before Us” profiling Union and Confederate soldiers. Gettysburg Rewards, a perks program offering discounts around Gettysburg, PA. Member announcements from the Rupp House. Since its launch, the interactive website has hosted over 10,000 visitors. If you’re not already a supporter of the Gettysburg Foundation, then these exclusive new website features should offer some added incentives. There are plenty of other perks, too, including free admission to visitor center programs, discounts at the park’s bookstore as well as other Gettysburg establishments, and a subscription to the newsletter. It’s a fine organization that does some very good work. The first of its kind in the nation, the Tennessee Civil War Geographic Information System (GIS) Survey shows hundreds of locations where Civil War battles, engagements, skirmishes and other military actions took place. The interactive GIS application for the Civil War in Tennessee is now available at: http://tnmap.tn.gov/civilwar/. The web site allows modern aerial photography, street maps and land use maps to be overlaid onto sites where Civil War actions occurred in Tennessee. It also links narrative information about these events from the Tennessee Civil War Sourcebook. Complete accounts of all the state units that served in the war are searchable by county along with 1860 United States Census data. This is one of the most comprehensive and useful online historical tools I’ve ever seen. You can select any engagement and get its location on a modern-day aerial, street, or terrain map, along with primary source material; instantly access unit histories relevant to each county; see the locations of historic markers across the state; and more. I clicked on my home county and found OR reports for actions in my hometown, along with descriptions of all the units that included local boys. Pretty cool! Go check it out. American students are less proficient in their nation’s history than in any other subject, according to results of a nationwide test released on Tuesday, with most fourth graders unable to say why Abraham Lincoln was an important figure and few high school seniors able to identify China as the North Korean ally that fought American troops during the Korean War. History advocates contend that students’ poor showing on the tests underlines neglect shown to the subject by federal and state policy makers, especially since the 2002 No Child Left Behind act began requiring schools to raise scores in math and reading but in no other subject. The federal accountability law, the advocates say, has given schools and teachers an incentive to spend less time on history and other subjects. “History is very much being shortchanged,” said Linda K. Salvucci, a history professor in San Antonio who is chairwoman-elect of the National Council for History Education. Yet it’s probably going to be the teachers themselves, rather than the policymakers and administrators who actually control the curriculum, who will get dragged through the mud for this. The armchair pundits who lambast teachers for not teaching this or that subject or concept don’t understand that teachers are beholden to guidelines handed down from above—you will cover such-and-such a theme with these attendant sub-themes, your students will be tested on such-and-such a content area, etc.